Located just 107 yards from the iconic Pulteney Bridge, one of only four bridges in the world to have shops across its full span on both sides. We are virtually in the centre of Bath, whilst at the same time in a relatively quiet street. You do not need to use the car once you are in Bath and checked into our accommodation. All the major attractions are less than 10 minutes flat walk and an abundance of shops, restaurants, cafes are within 2 minutes walk and Waitrose is around the corner. If you want to get away from all the hustle and bustle of town, then there is a very nice and peaceful park just behind Grove Street, called Henrietta Park. We also recommend a stroll along the canal, which can be reached by walking through Henrietta Park into Sydney Gardens, from where you can access the canal. In Sydney Gardens you will also find the Holburne Museum, which is worth a visit. 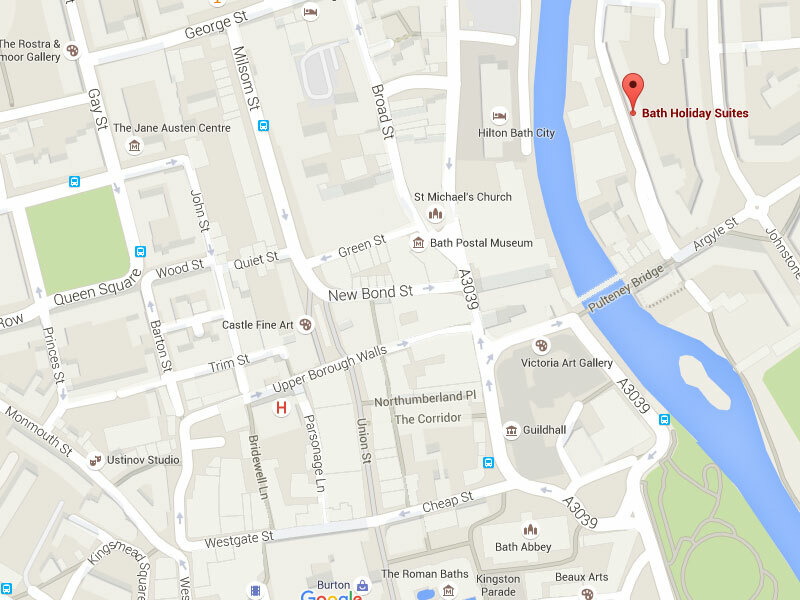 By train it's a 10 minute easy walk from Bath Spa Station to Bath Holiday Suites. No real need to get in a taxi. Take Pierre Pont Street right opposite the station. and follow the road, keep right along the river Avon till you get to the Pulteney Bridge. Cross the Pulteney Bridge and Grove Street is the 1st street on your left. Bath is easily accessed from Junction 18 of the M4 for those travelling from the East or West, or from the M5 for those coming from the North or South. Bristol Airport is your first option, as it's only 20 miles from Bath, with both Easyjet and Ryanair having a presence. From the airport, take a shuttle bus to Bristol Temple Meads Station and then the train onwards to Bath or even better take the AirDecker directly to Bath. Other options are Southampton Airport (60 miles), there is a train station at the airport (Southampton Airport Parkway), and the journey time to Bath is around 2 hours, though you will probably have to change once - use National Rail Enquiries to find out more. London Heathrow (100 miles), the world's third busiest airport is also accessible from Bath. There are several ways to get from the airport the easiest of which is to take the direct National Express coach in around 2 hours and 30 minutes. Alternatively, take the regular RailAir Bus service to Reading, where you can connect with London-Bath rail services. You can often park in the street or in any of the streets nearby. We can provide a parking pass for the duration of your stay but you will have to let us know in advance.